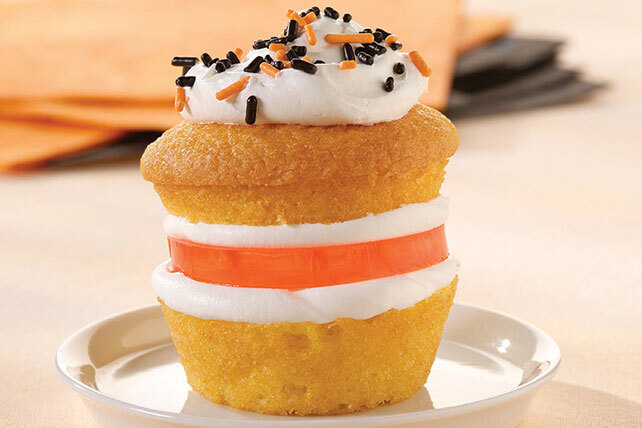 Transform cupcakes into jiggling towers of fun with the Wigglin' Jigglin' Cupcakes recipe. Wigglin' Jigglin' Cupcakes are split-in-half cupcakes stuck back together with a layer of gelatin cutouts and whipped topping are sandwiched inside. Add boiling water to gelatin mix in medium bowl; stir 3 min. until completely dissolved. (Do not add cold water.) Pour into 15x10x1-inch pan sprayed with cooking spray. Refrigerate 3 hours or until firm. Meanwhile, prepare cake batter and bake as directed on package for 24 cupcakes. Cool completely on wire racks. Dip bottom of 15x10x1-inch pan in water 15 sec. Use 2-inch round cookie cutter to cut 24 JIGGLERS from gelatin. Cut cupcakes horizontally in half. Place 2 tsp. COOL WHIP on bottom half of each cupcake; top with 1 JIGGLERS and 2 tsp. COOL WHIP. Cover with tops of cupcakes; press gently into COOL WHIP to secure. Top with remaining COOL WHIP and sprinkles. For children under 4 years of age, cut JIGGLERS into small bite-size pieces. Children should always be seated and supervised while eating. For more information, visit www.KraftKidsSafe.com. At 24 servings, this fun dessert is perfect to serve at a party or classroom celebration. Refrigerate the gelatin remaining in the pan after the JIGGLERS are removed up to 2 days. Cut into small pieces, then toss with fruit for a colorful dessert the entire family is sure to love. Prepare using 4 pkg. (3 oz. each) JELL-O Orange Flavor Gelatin. Prepare using a white or chocolate cake mix.